If you have been waiting to purchase RESPeRATE until now, waiting for a special deal, wait no longer! This is 2018 best deal. 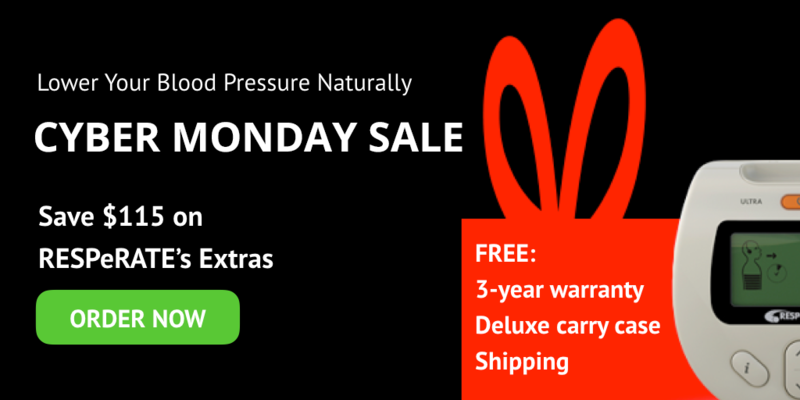 Starting today, “Cyber Monday” and for a very limited time, we will top any purchase of a RESPeRATE model a 3-year extended warranty, Deluxe Hard Carry Case and FREE shipping. Most importantly, when you buy directly you receive a 60-day money back guarantee and FREE return shipping should you need it. Take advantage of our year’s best deal. You’ve got nothing to lose but your high blood pressure. This gives you 3 full years of protection on either the Ultra or Duo RESPeRATE units. Should your RESPeRATE fail, we will happily replace your unit for free. On top of that, you will also receive our RESPeRATE “Deluxe Hard Carry Case”. Many of our users say they love this case. It protects your RESPeRATE when traveling for business or on vacation. Everything fits comfortably in the case. Your RESPeRATE unit, earphones, and sensor belt all protected in one easy to carry case. In total, with the free shipping, you will be receiving over $100.00 in add-ons free. Get it online or your Black Friday special by phone at 1-800-220-1925.